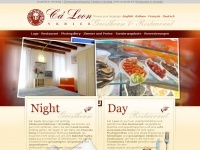 Locanda Ca' Leon in Venice is the spacious and comfortable guest house in a quiet area, fot a modern style holiday with your family or friends. Nozio - Internet per il Turismo - http://www.nozio.com/business/ is specified as the websites creator. The web server with the IP-address 94.23.185.62 used by Caleon.it is run by OVH SAS and is located in France. The website Caleon.it has a own web server. The web server only runs this website.